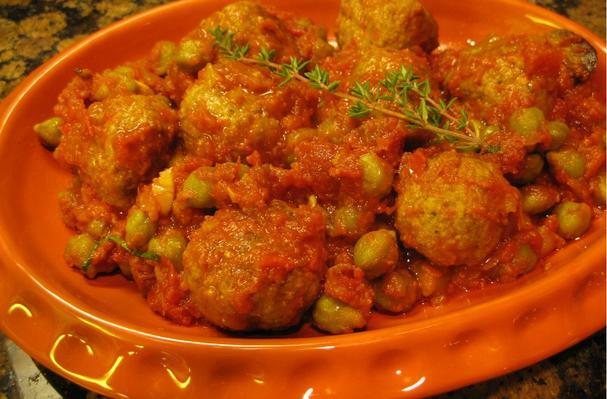 Meatballs (Albóndigas) 1 ½ lbs. ground Turkey 1 egg 3/4 cup dried bread crumbs ½ cup milk 1 tsp. salt 1 tsp. ground marjoram 1 tsp. ground cumin 1 tsp. ground coriander ½ tsp. ground nutmeg ½ tsp. smoked paprika 2 cloves garlic, chopped 2 tablespoons olive oil Combine all ingredients above (for meatballs) in a mixing bowl. Form mixture into golf ball size meatballs and place on a large sheet pan coated with olive oil. Place in 400 degree oven and bake for about 8-10 minutes until firmed and slightly brown. Tomato Sauce 1 28 oz. can crushed tomatoes 1 6 oz. can tomato paste 1 cup white wine 1 small onion, chopped 2 cloves garlic, crushed 1 tsp. salt ½ tsp cayenne pepper 1 pinch of saffron 3 tablespoon olive oil ½ cup fresh of frozen peas In a large ovenproof pot, add the olive oil, onion and garlic and stir, over medium heat until the onions are soft and translucent. Add the remaining sauce ingredients to the pot and simmer on low for about 10 minutes. Add the meatballs to the sauce, cover pot and place in 325 degree oven for 45 minutes. Serve warm as part of a Spanish tapas party or as an entree with some basmati rice and an interesting green salad. All over the world you will find meatballs, but these Albóndiga of Spain have a Moorish origin with a generous use of delicious spice. These are great for a tapas wine party and will pair well with a fruit forward spicy Spanish Garnacha.